As a college student living away from home, we tend to have friends over pretty often. We decided to create something that could make our apartment look cooler so we searched on Hackster for ideas. We came across a LED light project that we thought was perfect so we decided to do this. These LED's are bought from Adafruit and are programmed to run various functions which display different light sequences depending on the users liking. This is the main difference between our project and others on Hackster. Ours has four "display options" while others have one option with just multiple colors. This is all due to our code. The coding portion was definitely the most difficult portion of the project as this was our first time doing it. After doing the project, we learned that it can be broken down into simpler pieces and is a lot easier. Our project uses two Photons which send information back and forth to each other. One takes values of a photo resistor and decides whether the lights in the room are on or off. If the lights are off, then it will publish an event through the Particle Cloud where the second Photon picks up the reading. The second Photon, which is controlling the LED strip, then turns on the lights and signals to the first Photon that it was successful where the D7 Board LED turns on. Live graph on Google spreadsheets using IFTTT. This is the circuit diagram of the connections to the LED lights. Make sure you connect to the "Din" pin and not the "Dout" one. 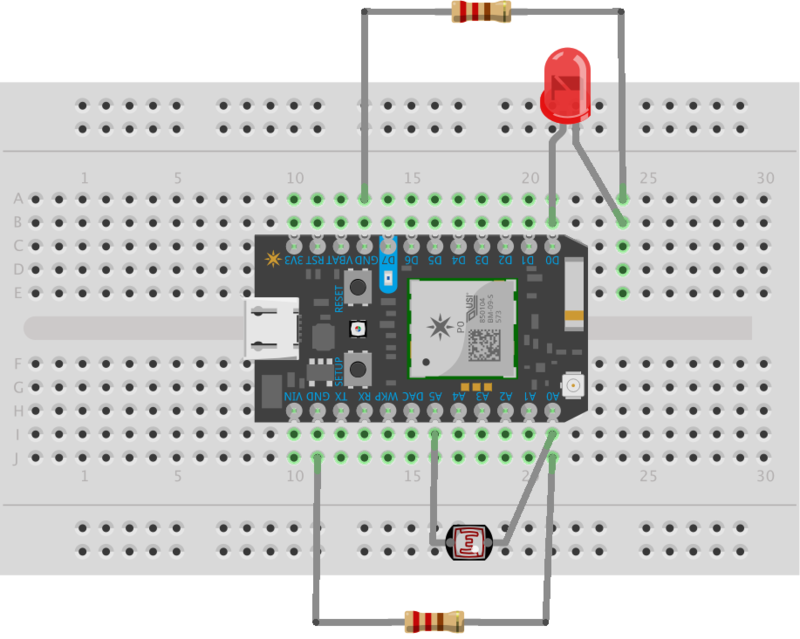 This is the code that you should upload to your Photon that controls the LED. WS2811/WS2812/WS2813 based RGB LED devices such as Adafruit NeoPixel strips. - Radio Shack Tri-Color Strip with TM1803 controller 400kHz bitstream. Written by Phil Burgess / Paint Your Dragon for Adafruit Industries. Modified to work with Particle devices by Technobly. //                     is the same as WS2812 or WS2813 in operation. //                     WS2812/WS2812B/WS2812B2/WS2813/TM1803 is GRB order. //                     respectively. Otherwise 300us timing will be used. This is the code that should be uploaded to the Photon which takes the photo resistor values. // Setting up all the important stuff ya know? // if he tells me to turn my light on then I turn it on.